Coffee shop etiquette – what do you need to know about it, and why it is important to learn today? In order to make a living in this day and age, you don't have to remain tethered to a desk and a chair in a conventional office. Thanks to advancements in digital technology, an increasing number of enterprising individuals have devised ways to work and earn profits even without the usual business setup. Sometimes, all it takes is a laptop, a smartphone, and a place with steady Wi-Fi. On your next visit to your favourite coffee shop, take a look around — is everyone there enjoying a casual cappuccino with a friend or two, or completely immersed in a book while they sip their lattes? Chances are, you'll find one or two (or a lot more) pounding away at the keyboard of their laptops, or reading from thick books and piles of paper, or keying notes into an app on their tablet PC while they speak to someone on the phone. These people have made the cafe their office for the day, and that's perfectly OK for many coffee shop owners, managers and baristas — unless, of course, they demonstrate unsavoury behaviour in the premises. If you're set to join the legion of entrepreneurs who do their work in coffee shops sometime soon yourself, you have to be aware of that observing the proper coffee shop etiquette is a must if you want to have a welcome space for you when you need it. Always purchase food and drinks from the cafe you'll be working in. As obvious as this may seem, there are still some repeat offenders who conveniently forget to spend on a cup of coffee or a sandwich while they work — some even bring their own food, and at meal hours, too! Don't be that person. Coffee shops are businesses too, so before you set up shop, buy your favourite drink or a cookie and enjoy those while you work. Limit your stay to about two hours. Some cafes may be willing to let their patrons stay for hours, but it's a good gesture to pack up and move on after about two hours to make way for other customers. If the place isn't crowded, reboot your computer anyway and order something new so that the cafe will also benefit from your long work hours. Be considerate with your bandwidth usage. The Wi-Fi may be free, but that doesn't mean that you should go ahead and stream videos or download large files. You'll be affecting the other customers' usage of the Internet connection too, so limit your usage to the basic functions so that everyone will stay happy. You shouldn't take up an entire table by yourself if it's supposed to seat four people. Make use of hooks and boxes that the cafe provides for patrons to hang their bags from or keep their things in; that way, you won't be using up the entire table or another chair. Share your table with other customers and let others use the electrical outlet, too. · Keep your voice down if you need to make business calls. Cafes aim to maintain a laidback vibe, so talk quietly into your phone or step outside for a moment if you need to. · Be mindful of your own belongings. You should be in charge of guarding your things against theft and protecting them against spills and damage due to carelessness. · Switch up your cafe visits. Take your work to different cafes, especially small local ones who can benefit from your business. It's good practice to have different options, too, so you can have a backup office. · Show your appreciation to your baristas. Finally, be generous with your praise (some give tips) for people who meticulously prepare your orders and help make you comfortable and well attended to while you work. This way, they'll always be happy to see you each time you step through the door. Ready to do great work in the comforts of a coffee shop today? 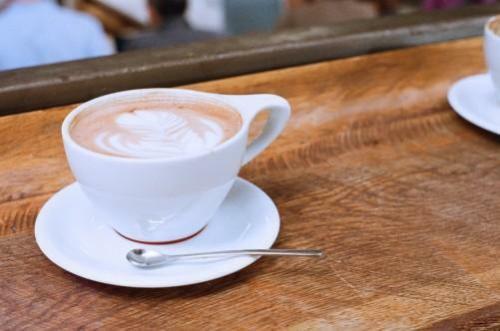 Check out Australia’s most loved coffee haunts here.